Children who love stories about mysterious creatures such as the Loch Ness Monster and Bigfoot will enjoy this imaginative tale about two children who wander away from their parents’ remote campsite, uncover one the world’s most unlikely teenagers, and have a night they’ll never forget. My son has always loved monsters. A few years ago, when he was eight, he showed me an Internet picture of Bigfoot riding the Loch Ness Monster. I joked that maybe they were on a date. Then we had a laugh thinking about what would happen if they got married and had a baby. What would that baby look like? What would his life be like? This animated story was originally developed for iPads but has now been redesigned specifically for iPhone4 and iPhone5 formats. Lochfoot is a simple, multimedia reading experience with 26 pages of rich illustrations, music, sound effects, voices and narration. It’s geared toward readers ages 4-8 who will enjoy the simple story of discovery, friendship and adventure. 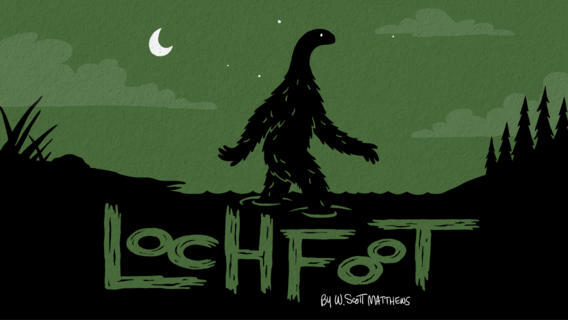 Lochfoot was designed and illustrated by W. Scott Matthews who is a Creative Director and Partner at The Tremendousness Collective in St. Louis, Missouri. Development by James Macanufo at Tintanker.com.